Linkbuilding is an SEO staple. No matter how much some Google employees have come to hate the spam spewing brainchild that catapulted them to commercial royalty, links remain an important ranking signal. To some the most important of ranking signals. While the above is roughly true, you can’t just create a great guide and expect it to generate you links on autopilot. We have been sold on this idea that content creation will automatically lead to exposure. There are thousands of link building guides out there but very few of them are any good. Google also seem to be currently phasing out link bulding for deepmind their machine learning algorithm. Also people presuppose you know enough to create better content than your competition. This often frustrates. Of course we are better than our competition, that should show in our work. Any idiot should see that so why don’t they? The issue comes from a mix of marketers stealing each other’s ideas, and spinning articles which miss the main point of link building, and wider marketing as a whole. Your run of the mill small business owner doesn’t know how to create great content, but too often neither do the SEOs they employ. You can easily build links to mediocre content – send a million emails to all the top influencers in your industry and some will yield fruit. That said if you track down and ask the billion richest people in the world for a dollar you would probably be a multimillionaire and never have to work again. There is no link between persistence and quality, yet a lot of link building guides say that the key is in persistence. This is a different kind of link building guide, which utilises your brand – the same methods that commercial giants use. Some people are great at building contacts and managing PR. I am not saying that doesn’t work. I’m here to change your idea about what content is and how you leverage it – in a way that anybody can do. What Is Great Content And How Can I Leverage It? You don’t want to be known in your industry as the link beggar. If you want to be noticed you have to be creative. Links aren’t everything, for online marketing the ends is traffic, and the means for SEOs are links to help search rankings. This is obviously a vast simplification to avoid going off topic. Great content that will generate you links on auto pilot does exist, I will explore some examples. The one thing linking these examples is that they have a viral factor. It’s not the content generating the links it’s your users liking the content who build links and share pages. Truly great content takes planning – not least on how your website is designed to deal with an influx of traffic. Not every post can be amazing. That doesn’t mean that every post should be mediocre. Often great content doesn’t lend itself to a basic blog post format. The brand is central to advertising. All the bells and whistles of modern online marketing (I blame exact match domains) have left the brand behind. People have the wrong idea of what makes great content, beating your competition isn’t necessarily good enough. To optimise is to make the best. Great content – from a marketing point of view – can be made up of just two factors. Hold up I hear you say – great content doesn’t need to be relevant? How can it rank on search if it isn’t relevant? Your website needs to be informative and relevant. You need your audience to understand rapidly who you are and why you’re the best when they land on your site. After you’ve done your time writing guides and exploring the depths of your niche with your website/blog it is time to go abstract. The content you create to promote your business doesn’t have to be informative, it has to be interesting. Everybody who sees your content has the potential to share it. Get creative with content which isn’t primarily made for hosting on your website. The more you give the more recognition you receive. On TV often ads have nothing to do with the product being sold. The best adverts make you remember a brand through multimedia. Jingles were a staple of the radio. A song can trigger hunger. The crunch of leaves underfoot can easily be associated with a foods – crisps or biscuits. I am using food because it is an easy example. Your goal is to make people remember you. There was a reason I listed entertainment before brand awareness – you want to be able to set your content loose and have people share it for you? Entertainment is the king of social media. What do a gorilla, drums, and Phil Collins have in common? Chocolate. Think how insane that answer would have been before the advert aired, but now with the power of viral media most people will know what I am talking about. That’s not down to more people buying chocolate, it’s caused by people writing about a monkey and a drumkit. Over time Cadbury’s hopefully become the brand people think of when they go in their local store hungry for a chocolate bar, but for now there is also authority flowing as the content is shared. At this point I would run a competition just to milk the campaign for all I can – share the video and subscribe to the channel for a chance to win big. I think Cadbury did, and it went down as the example of viral media while I was training. What’s stopping you scaling this down I thought? I would say the only real cost you can’t work around is the suit, but all in the advert could be recreated for less than £200 if you had to pay for everything. It wouldn’t work because it has been done before, but amazing TV worthy content doesn’t have to be expensive. Cadbury’s advert would have cost thousands (or tens of thousands, maybe even more). If you pay your students and make sure you find real talent you can create great, original music/video content with your brand on show for peanuts. If you can get a YouTube sponsorship you will have created a whole new income stream. Big businesses spend millions sponsoring sports personalities in the hope they will perform a superhuman feat with their brand on show. Red Bull are the king of this form of viral marketing and it has worked. If you ask people to name an energy drink brand they will usually say Red Bull. Red Bull can charge more than other soft drinks because people believe that it has more value. It gives you wings. A very strong and sugary coffee is probably as effective as Red Bull at waking you up, but through the power of money marketing entertainment Red Bull has become the drink people grab when they are hungover before work. I want to share my favorite Red Bull sponsored video to show how a big brands market themselves – I had a lot of choice but this one take the crown. This isn’t a TV advert. It doesn’t push the brand in your face and there is no call to action. Still this 7 minute video gave Red Bull’s authority a shot in the arm. It is hugely viral (50,000,000 views on YouTube as of writing) and it is an amazing piece of work. When people link to the video they are likely to link to more of the subject – Danny MacAskill’s – work but the exposure Red Bull have gained is priceless. This helped build Red Bull the authority site that they are today (250,000 backlinks at time of publishing). Is it an advert? Red Bull supplied Danny’s helmet and the course – at great expense – but they don’t rub it in your face (too much). You may be screaming to me “how can I afford this kind of marketing”. You can’t (probably), but think outside the box. I feel the need to defend what I said earlier. If you can make truly great content inform, and be relevant to your brand then that is a massive bonus. All I said was it isn’t necessary. Great content needs to bring curious traffic to your site. If you are SEO focused it will need to bring links too. If you have a clear understanding of your audience demographic you can make a cool video which will bring you very targeted leads. To gain links on autopilot you to know what will push a very specific demographic into a sharing frenzy to be the first to show all their friends. Social media is driving ‘real media’ – if something goes well and truly viral socially it will start hitting the news blogs, then the news. If links are your goal you don’t need to muddy this content with information. All you need is a clear idea of your demographic, and a well thought out sales funnel. I have used huge brands as examples until now, but you don’t need a huge budget to launch a successful viral marketing campaign. You don’t need big sponsorships or the resources of international corporations. The other day I was asked how I would market a real estate website which sells condos in gated communities. They had a great website, but traffic was an issue and they weren’t making sales because people weren’t finding them. For that niche it was easy to suggest a piece of great, viral content that would be relevant. Employ a free runner to do a guided tour of their condo inside and out. It’s very relevant, and also manages to be informative as people would be able to see the condos they might buy. Most importantly it will share itself, people will build links to it, and they will become know as those guys who got freerunners to do tours of their condo. Local media will love having something to talk about, and if it takes off regional media will pay attention. Hiring a freerunner is not expensive, if they have GoPro already you’ll save on costs there. With the right execution one video will generate exposure for a long time. I am not saying the only great content is video. The SEO niche is nerdy enough that we get very excited about a great infographic or in depth case study. The Moz 2015 Ranking Factors case study is amazing content. Big data works better in images and video – with planning it can be digested more easily – which is convenient because it’s easier to share that way. Image and video are the two media where you can really push your brand without necessarily giving anything else away about your business – leave people to find out more themselves. As I have shown this can be really effective. We live in the smart age – smart phones, smart watches, smart glasses. I would like to present a smart advert. 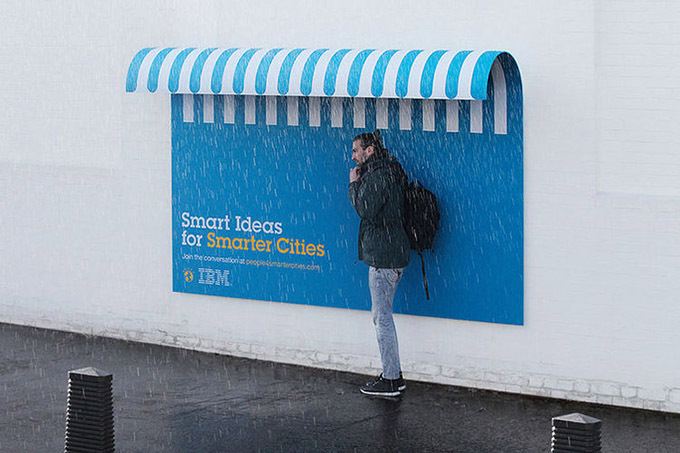 Everybody knows IBM, but if you were a small brand it wouldn’t be too expensive to setup a similar marketing campaign. It’s a great piece of content in the real world designed to be shared online as well as providing shelter. You have to take risks in business. How could you make this advert cheaper? If you own a brick and mortar business put this billboard outside. Fabrication would be expensive but not bank breaking. Great content is creative use of the tools and space you have. Great content makes others blog about you. Killing some time waiting for the rain to stop – why not follow a QR code. People love using their gadgets, we all love useful clever designs, and travellers are often itching for an excuse to take a selfie. Any exposure this advert gains IBM also a gains – from social media to interviews – they did a great job of leveraging this real life content. This great piece of design will have generated IBM plenty of backlinks, but for a small-medium sized business managing their own PR it may generate even more attention. People know about IBM, your small brand is interesting and you have proven your creativity. Now show me the products. Take it one step further with reverse graffiti, be enigmatic by printing QR stickers that link to your social media or a landing page. Find some local artistic talent and ask them to design you a stencil which promotes your business. 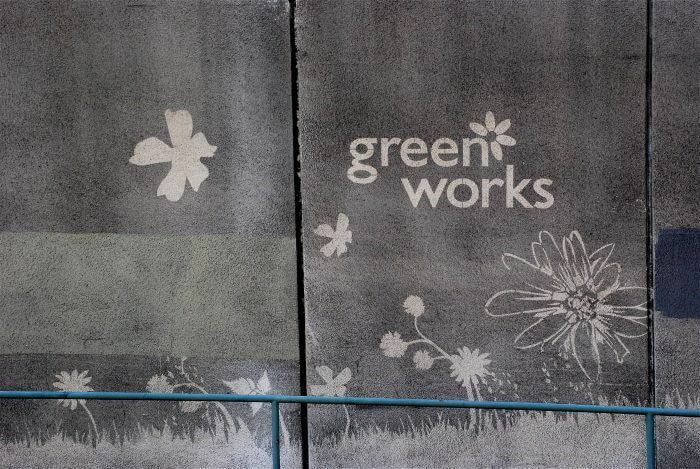 Instead of using spray paint, wash the surface you want to advertise on for a eco friendly piece of temporary graffiti. Cleaning a surface isn’t illegal, and as long as you have the building owner’s permission you can keep the stencil fresh by going over it again and again. One stencil can rapidly be replicated time and again. Look at the work of banksy to see how stencils can be used to virally spread an idea worldwide. Every artist (I’m using the term broadly) wants a sponsor. Just because you aren’t Cadbury, IBM, Red Bull or and may have a tiny budget doesn’t mean that you can’t benefit from their methods. They gain a little more authority from this post and the ball keeps rolling. They continue to profit from adverts (content) made years ago. There’s this idea that you should spend drastically longer on promotion than on content creation. I hope to have opened your eyes to the fact that great content honestly can promote itself. If you are small start small. Plan your first advert carefully. Make sure people notice what you are doing and ensure your website and social media is ready to make the most all the traffic generated. Prepare to give out discount codes, or run competitions, build email lists and compound your profit. Look at what the big fish do. They have huge marketing departments. They know what works and have been doing it for a long time. Copying content is bad, but copying methodology to improve on an idea is great. Gorilla/Guerrilla marketing works. Try it. In our company, we primarily focus on link building. What I’ve noticed is that most clients are looking for local SEO. Anyway, great article.